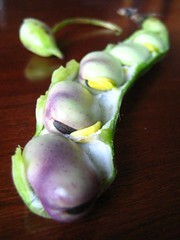 purple fava beansIt is believed that along with lentils, peas, and chickpeas, fava beans became part of the eastern Mediterranean diet around 6000 BC or earlier. They are still often grown as a cover crop to prevent erosion, both because they can over-winter and because as a legume, they fix nitrogen in the soil. Favas — also known as Windsor beans, English beans, horse beans, and pigeon beans — have long been diet staples in Asia, the Middle East, South America, North Africa and Europe. They were the only beans Europeans ate before they discovered America and all its legumes. The beans have a buttery texture, slight bitterness and lovely, nutty flavor. Fava beans can be served simply boiled, mashed and spread on crostini, or added to spring stews and soups. And, favas are nutrition superheroes. They are high in fiber and iron, and low in sodium and fat. They have no cholesterol but are high in protein. Summer squash differs from fall and winter squash in that it is harvested before the rind hardens and the fruit matures. It is one of the most prolific crops we grow, with one plant able to produce dozens pounds of squash throughout the summer. Here at the farm we grow three different varieties of summer squash; a green zucchini, a yellow squash commonly called crook neck, and a UFO shaped squash called patty pan. The patty pan squash is probably the newest to you, but you can use it just like you would zucchini. It is my favorite summer squash. As its name suggests, summer squash is a true announcer of summer, and is one of the steady crops that usually accompanies us until the fall. Spinach is an edible flowering plant in the family of amaranth. It is native to central and southwestern Asia. In 1533, Catherine de'Medici became queen of France; she so fancied spinach that she insisted it be served at every meal. To this day, dishes made with spinach are known as "Florentine" because Catherine came from Florence, Italy. Spinach, along with other green leafy vegetables, is considered to be a rich source of iron. 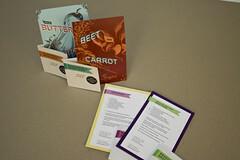 Holiday Cards Our friends at Corey McPherson Nash designed their 2009 holiday cards around recipes from TFP's farmers, as can be found on this very blog. What better way to celebrate the season than by cooking something delicious with seasonally appropriate ingredients? Thanks to CMN for donating to us on behalf of their clients, and for spreading the word about The Food Project through these recipes! These burgers are delicious. They are a little labor-intensive, but you can freeze and reheat them for a quick, nutritious meal when you're running behind schedule. Enjoy! 1. Preheat oven to 350 degrees. Lightly grease a baking sheet. 2. Place a small, heavy skillet over medium heat. Add the sesame seeds and stir them until lightly browned and fragrant, 3 to 5 minutes. Remove from heat and transfer to a small bowl. This is the soup that I grew up on. In Portuguese, we call it "Caldo Verde," or a green broth. My mom uses collard greens, because it's most similar to the portuguese kale or galician cabbage that she used back home to make this soup. The traditional way of cutting the greens is to stack them flat, roll them up like a hot dog and then slice along the roll to get very thin strips. In a large pot, sauté the garlic and onion in olive oil over medium heat, stirring until soft – do not brown. Add potatoes, water and broth, bring to a boil and then simmer until potatoes are soft (10 – 15 minutes). While the potatoes are simmering, cook linguica in a skillet over medium to high heat, browning on both sides. Transfer to paper towels to drain. I’m not 100% sure what triggered this, it may have been Sundays 59-0 Patriots snow infused dismantling of the Titans or that the fields have transitioned from summer crops to fall, but I started thinking about miso soup today. Most seasons the transition from ratatouille to miso soup isn’t as pronounced. The 2009 season has yet again surprised me. Add olive oil, carrots, and leeks into a pan and sauté until carrots are less crunchy (approx 10 minutes). Add bok choy, tofu, and water to just cover the veggies and cook until bok choy is tender. Remove from heat and add miso (follow directions for use on miso container). Add crushed pepper and soy sauce to taste. 1. In a large pot over medium heat, melt butter. Cook leeks in butter with salt and pepper until tender, stirring frequently, about 15 minutes. 2. Stir cornstarch into broth and pour broth into pot. Add the potatoes and bring to a boil. Season with salt and pepper. Pour in the cream, reduce heat and simmer at least 30 minutes, until potatoes are tender. Season with salt and pepper before serving. We hope to see you at Long Hill at our Fall Fiesta this coming Saturday. We'll be having a potluck lunch from 12:00 - 1:00 PM, and then will be pressing apple cider afterwards with our old-time cider press until 3:30 PM. Please join us for all or part of the day. The crunching of the apples sounded harsh but appetizing. Anyone passing by who heard this sound could not help reaching for an apple and taking a bite. The sweet cider poured out of the pipes in a thick stream, reddish-yellow, sparkling in the sun. Anyone passing by who saw this could not help asking for a glass, taking a sip and then just standing there, his eyes moistened by a sense of well-being and sweetness which surged through him. And this sweet cider filled the air far and wide with its delicious fragrance.